CHARLESTON, S.C. — Former Chicago Cubs second baseman, Ryne Sandberg, will be the keynote speaker on Jan. 22 at the annual Charleston RiverDogs’ Hot Stove Banquet and Auction to be held at the Charleston Marriott. Prices are $70 per person and include dinner, a table gift and autograph or photo opportunity. Tables of 10 with preferred seating are available for $680. For ticket information see riverdogs.com or rileyparkevents.com. Source: Post and Courier. 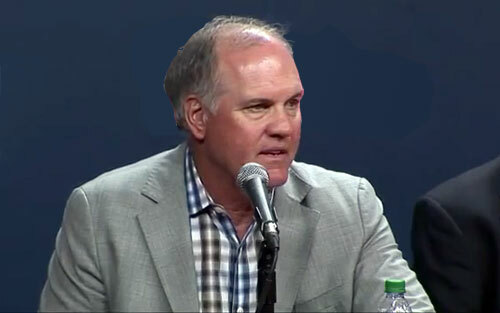 Ryne Sandberg, nicknamed “Ryno,” is a former MLB second baseman. He played Major League Baseball for sixteen years (1981–1994 and 1996–97) and spent nearly his entire career with the Chicago Cubs. He was named for relief pitcher Ryne Duren, and is recognized as one of the best second basemen of his era. Sandberg was elected to the National Baseball Hall of Fame in January 2005; he was formally inducted in ceremonies on July 31, 2005. Sandberg is also the former third base coach and infield instructor for the Philadelphia Phillies. Ryne is a popular motivational speaker. Sports Speakers 360 is a booking agent for pro athletes. If you would like to book Ryne Sandberg for a speaking engagement, appearance or endorsement, contact Ryne Sandberg’s booking agent for fees at 1.855.303.5450.